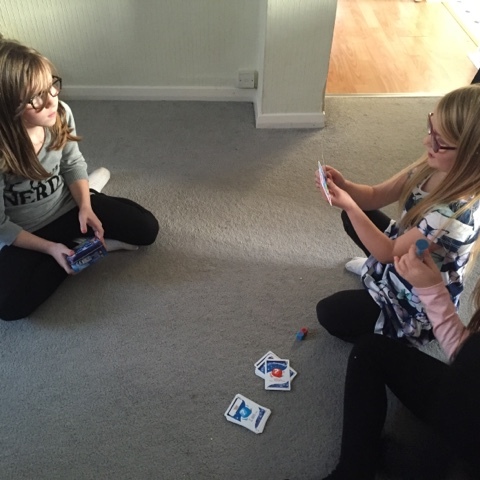 Just before Christmas the girls and I were kindly sent a new game to play and enjoy over the festive period. 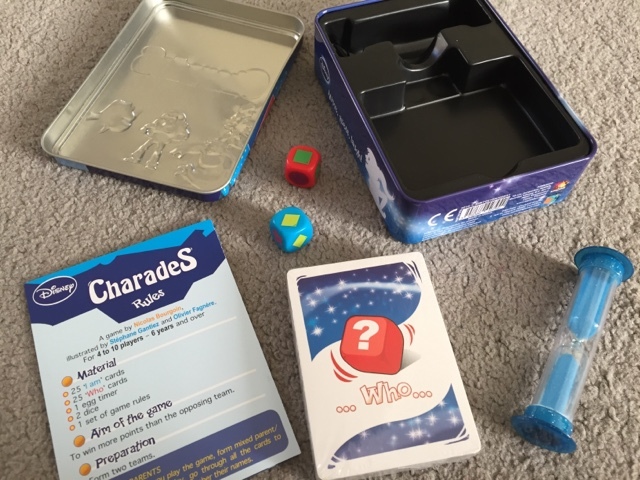 Disney Charades from Esdevium is a new twist on a classic game. 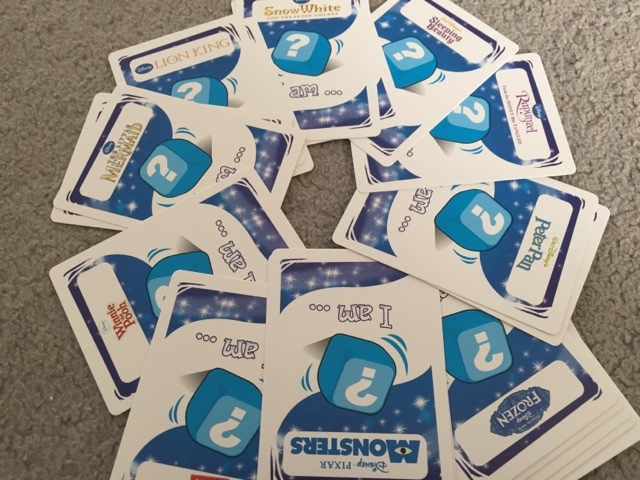 Aimed at children aged 6 and upwards, it is a team game where you win points by guessing the Disney character and what they are doing. 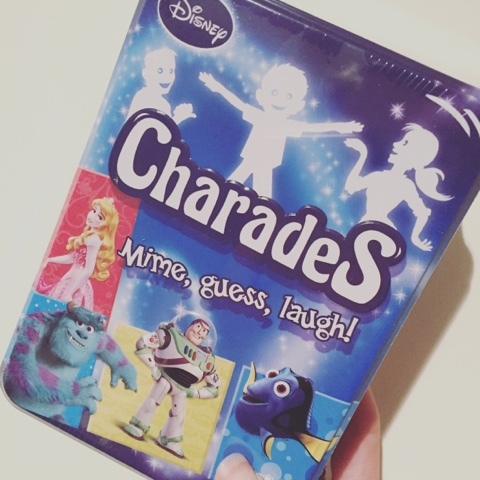 This is essentially a simplified version of the charades we are used to, the Disney element allows it to be suitable for both children and adults, making it an ideal family game. I would say a little Disney knowledge would come in handy when playing this but if you play enough rounds you will soon start to remember certain characters and lets be honest half the fun is in the guessing. There are two sets of cards and two dice which work together. The shapes on the dice show you which 'who' and 'I am' on each card you need to perform to your partner. 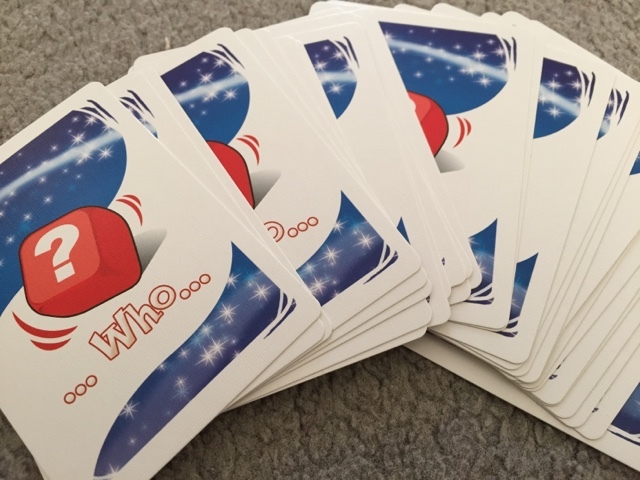 The 'who' cards are where you need to guess the actions of the Disney character and the 'I am' cards show which character you are. The characters are taken from all the well known films such as Toy Story and Winnie the Pooh making them recognisable to most. Each pack contains 25 cards giving you many combinations, keeping the game interesting each time you decide to play it. 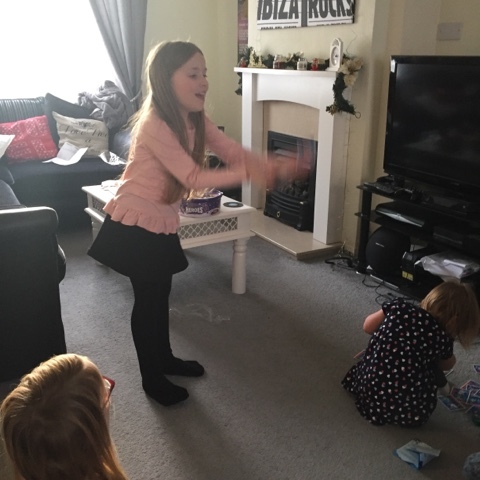 If you've not played Charades before (why not?) then I'll tell you it is all about miming, the difference with this version is that you no longer need to be silent. The rules state that you can make noises but you musn't speak, I will admit that we broke this rule quite often when the younger kids were involved but it certainly didn't take away from the game at all. What I really liked is that the length of the game can vary depending on how correct answers you can come up with as the game shouldn't stop until all pairs have been claimed. But on the flip side of that, it is a game that can easily be cut short by counting who has won the most pairs so far. 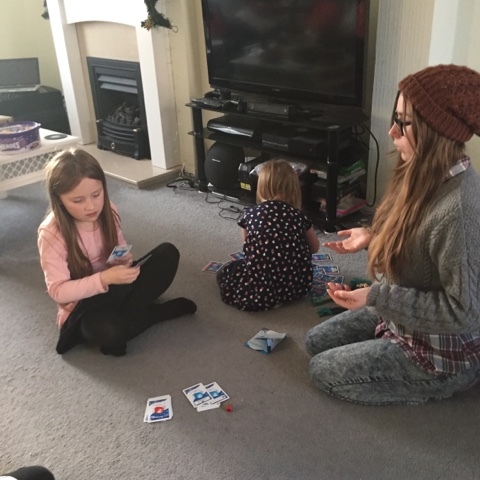 Watching my kids trying to act out what was on their cards became real entertainment and I've never been so stumped in my life with some of the things they were doing. All in all I would say Disney Charades is well worth purchasing. Brings young and old together and leaves you all laughing. Now if you like the sound of this, you can win Disney Charades for yourself. All you need to do is fill in the rafflecopter form below. Open to UK residents only the giveaway will close on the 26th January 2016. All entries will be checked and verified so please enter correctly. I enjoy playing Junior Scrabble with my little ones! It has to be Sorry! Still has to be the original Monopoly. We love playing the shopping list game! At the moment dinobite is the favourite. As much as I love Logo, I've still got a special place in my heart for Cluedo, mainly because I'm unbeatable at it! Mine is scrabble. Thanks for the giveaway, this looks like a good game. Mousetrap. (It is NOT just for children). I've always liked Clue. We just did give Pandemic a try, and I'd highly recommend it. Monopoly - I love to feel like a property magnate ! I love the LOGO board game , its so much fun! in our house we love Twister not a board game but brings the whole family together and is so much fun! Our favourite game is Disney Monopoly. My kids would love this. Fantastic Giveaway! For the little ones to enjoy with the adults, we pull out an old snakes and ladders board game so everyone has an equal chance. It's a long-time favourite, despite the many other wonderful board games that are currently available. I would have to say its between Monopoly and Game of Life. I got Game of Thrones Monopoly for Christmas which is amazing! 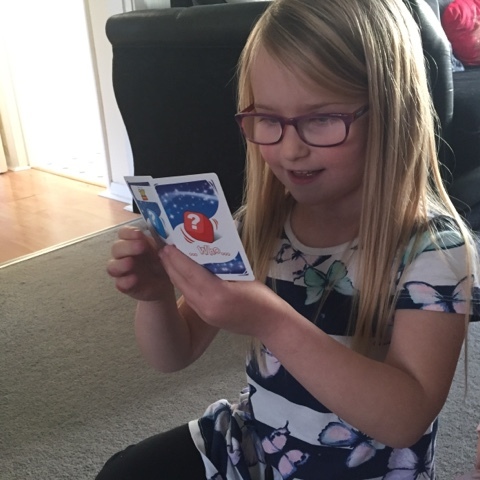 My daughter got the magic tooth fairy game for Christmas and she really enjoys it. I love the classic cluedo! Not technically a board game but we have lots of fun with Rapidough! I love cluedo but every time our family gets together we play charades and it is hilarious as we're a bunch of big kids! Monopoly but we play Despicable Me version.